In 1771, West painted a copy for George III (collection of Her Majesty the Queen). West painted at least 4 additional versions. The painting was engraved by William Woolett and published by John Boydell. Helmut von Erffa and Allen Staley, The Paintings of Benjamin West (New Haven, CT and London: Yale University Press, 1986), p. 213. John Galt, The Life, Studies, and Works of Benjamin West, Esq. President of the Royal Academy of London, Composed from Materials Furnished by Himself , vol. 2 (London: T. Cadell, 1820), p. 232. Quoted in Allen Staley, Benjamin West. American Painter at the English Court. Exhibition catalogue (The Baltimore Museum of Art, 1989), p. 54. “Eighteenth-century notions of masculinity promoted honor and courage in the face of war and death, tragedies that bound men together in pain, suffering, and anguish….the Native American symbolized the masculinity of an alien culture, that of the natural, uncivilized man. His naked body is displayed in opposition to the clothed Europeans, whose military uniforms signify masculinity, courage, and strength. Although the Indian, as a warrior, is part of the scene, his nakedness and accoutrements – trade blanket, hunting pouch, and body paint – simultaneously single him out. His partial nakedness likewise affects how we see him: both exposed and covered, he is available to our gaze yet hidden from full view. Vivien Green Fryd, “Rereading the Indian in Benjamin West’s Death of General Wolfe, American Art, vol. 9, no. 1 (Spring 1995): 83-4. 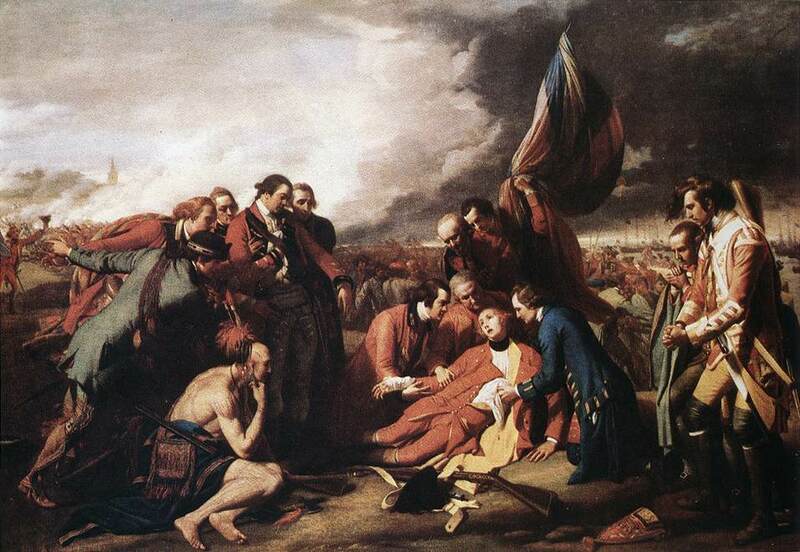 Dennis Montagna, “Benjamin West’s The Death of General Wolfe: A Nationalist Narrative,” American Art Journal, vol. 13, no. 2 (Spring 1981): 85-7.